Your child will be just like this fun-loving and curious character from his favorite television show when you shop for Pocoyo Party Supplies, like tableware items, decorations, and fan favors. From plates and cups, to balloon bouquets and cone hats, to wall decals, favor boxes, thank-you notes, invitations, and lots more are here for you to make the perfect event! Bring the creativity of Pocoyo’s world to your child’s birthday. If your kids love Pocoyo, chances are good you've caught the bug, too! From the moment this 3-dimensional guy and his friends pop out of their box at the beginning of TV show, to the adventures and fun they have, kids are hooked. 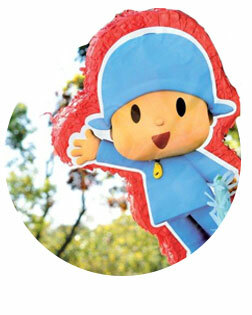 They identify with Pocoyo’s curiosity and quick moves. Parents love the creativity and educational components of the show. It makes sense that for your child’s birthday, you want to invite Pocoyo, Pato the duck, Elly the pink elephant and others. At Birthday Express, we have everything you need to make it feel like their party is taking place inside their favorite cartoon. To make the party truly great, spend some time with your child watching some Pocoyo episodes and find out who their favorite characters are. This will help determine who makes an appearance on the cake so you can cater the perfect party. There’s a lot to sort through when it comes to planning the perfect Pocoyo party. To help, we have a huge number of party themes in our Ideas blog. Here you can find inspiration in a number of different party games and preparations. Let the fun begin before the first piece of cake is served! Start spreading the word about the party with these invitations, which will excite the little ones with images of pink elephants and friendly ducks waddling by. Before order the cake and well before the first cup of punch is poured, the party begins with getting the right decorations. It can be a little overwhelming! After all, how do you make the magical cartoon world of Pocoyo come to life? Don’t worry. With big colorful prints and banners, we have what you need to transform your house or yard into a fun-filled, Pocoyo-inspired party your child is sure to love. Nothing says fun like a balloon. We’ve put all of Pocoyo’s friends on two classic party balloons and added latex and foil balloons to make a complete balloon bouquet. All balloons ship flat and the foil balloons are approximately 18″ in diameter. Pato the duck, Elly the elephant, Loula the dog and Pocoyo are all here to celebrate the big birthday. What’s missing? A personalized greeting to make the day extra special! And we have just that. Available in three sizes, these durable banners are perfect for indoor or outdoor use. Spread out the tablecloth and bring out the fine china! When your child and their friends are ready to settle down and enjoy the cake, make sure they’ll be able to enjoy it on the finest tableware inspired by their favorite cartoon characters. We have cups and plates decorated with those adorable characters from Pocoyo’s world. And since no child’s birthday party is complete without the usual spills and messes, we have unique napkins featuring Pocoyo himself! If you’ve seen an episode of Pocoyo, you know how much fun a little curiosity can lead to. It’s that kind of imaginative adventure you want to replicate at your child’s birthday party. To do this, we’ve brought together some great activities that will keep the smiles on your child’s and guests’ faces shining big and bright. With everything you need right at your fingertips, we’ve taken the hard part out of planning for that perfect birthday party! If the energy ever starts to cool off, the Pocoyo piñata will quickly gather everyone together and reboot the fun. Let them line up and take a few swings until a shower of candy and toys rains down. The kit comes with a pull-string piñata, blindfold, buster and assorted candy and toy filler. It’s hard to express just how much fun kids can have with these simple party supplies. You’ll probably want to join in the fun when you see their faces light up and their cheeks puff up with our super-fun Pocoyo-themed Deco Kit. Everybody loves a party but no one really loves it when the party is over. With our selection of Pocoyo party favors, you’ll be able to show the guests how much you appreciate them for coming over to celebrate the birthday of your special guy or gal. These goodies will ensure that the spirit of the party will continue for days on end and make everyone excited to come celebrate your child’s next birthday! Here’s a box that is sure to keep them busy. This box has all the goodies a little kid needs for some creative fun. With a sticker set, a blowout, mini rubber ducky, glitter bouce ball and doggy finger puppet and more, this is the simple way to make sure everyone leaves with something fun. Kids love tattoos, and since these wash off with soap and water, parents will love them, too. 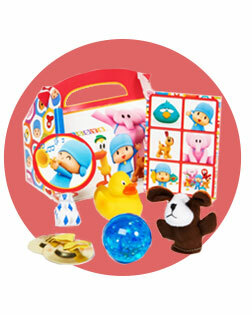 Each package includes eight temporary tattoos featuring detailed images of your kid’s favorite Pocoyo characters. You’ve put a lot of work and a lot of thought into planning the perfect Pocoyo-themed party for your kid. No doubt you’ve wondered what else you could do to really make this day stand out. We at Birthday Express have come up with the perfect solution: Personalization. We’ve brought together a range of products and have made it simple for you to personalize them with a unique message that will be the highlight of your little one’s day and really let him know how special they are. Printed on durable vinyl with high-definition technology, this banner comes in three different sizes to perfectly meet your needs. All you have to do is upload a picture of your cutie, then add the text (you can even select the font and text color) and we’ll take care of the rest. It’s that easy! Make the cake even more delicious with these unique dining plates. Your little one will feel like they’re part of Pocoyo’s crew when they see their face hanging out with their favorite cartoon friends. It’s easy to make their dining experience that special!